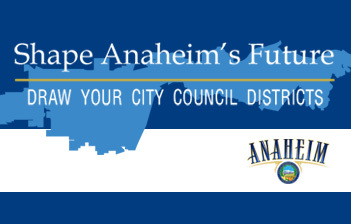 ANAHEIM, CA - (May 5, 2015) - Anaheim residents are encouraged to participate in community meetings and Shape Anaheim’s Future. Anaheim’s current At-Large electoral system will, for the first time, change to a By-District system made up of six districts. Participants will provide input and insight into where the City Council voting boundaries will be drawn. The first of a series of meetings will be held Tuesday, May 12, at 6:30 p.m. in the City Hall Council Chambers, 200 S. Anaheim Blvd., 1st floor. Public input from the meetings will be reviewed by an Advisory Committee composed of five retired Superior Court judges - James Jackman, Nancy Wieben Stock, Stephen J. Sundvold, Thomas Neal Thrasher, and Edward J. Wallin. The public and Committee will have the assistance of an expert demographer at each meeting. The Committee will make its recommendation to the City Council by October 6. The Council will hold public hearings and make the final determination by the end of this year. The new districts will take effect for the November 2016 elections. The Advisory Committee meetings will be broadcast online and Anaheim’s local cable Channel 3. Visit www.anaheim.net/districts for more information.